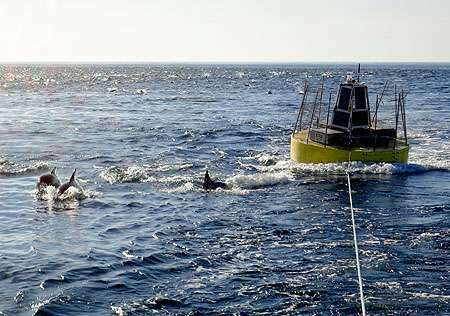 In early January 2015, a team of MBARI engineers, led by Andy Hamilton, set out to sea to recover an experimental buoy that creates electrical energy from ocean waves. This power buoy had been deployed six miles southwest of Moss Landing Harbor for 131 days, while the engineers tested the system's ability to handle storms. The power buoy has been in development for six years, and has been deployed and recovered six times over the past four years. Modifications after each deployment have increased the power buoy's efficiency and the amount of time it can spend out in the ocean. This most recent deployment was the longest the power buoy has been able to stay out at sea so far. The buoy itself is eight feet across. Hanging in the water below the buoy is a long cylindrical wave-power converter that contains two pistons, a pneumatic spring, a hydraulic system, and an electrical system (see illustration). Below the power converter hangs a massive fiberglass and metal plate, about four meters (12.5 feet) wide and three meters (9 feet) long , which provides the necessary resistance to operate the buoy's piston systems. The linear motion of the pistons inside the cylinder drives the generation of electricity from ocean waves. The current version of the power buoy can generate 300 to 400 watts of power during average wave activity, and up to 1,000 watts during storm conditions. 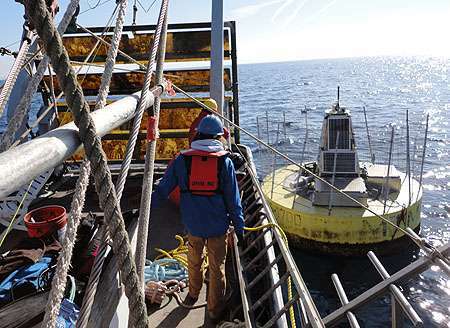 For this experiment, the system was anchored to the seafloor using a heavy anchor (not pictured in the illustration) to keep the buoy from drifting toward shore. The design also incorporated a stronger tether and a new plate design with built-in flaps to help alleviate stress on the power converter and tether during storms. Unfortunately, this complicated design also makes the power-buoy system challenging to recover. However, MBARI engineers have developed an efficient method for recovering the buoy and bringing it back to the lab for maintenance. During the recent recovery, scuba divers first attached ropes to the metal plate and the power converter. Then the plate was pulled up out of the water and secured to a metal frame on the back of the boat. Once the plate was secured, the team raised the anchor, cleaned off the seafloor mud, and hoisted the anchor on deck. Then the team hoisted the power converter up to the surface of the water and attached floats to it so it would float horizontally in the water behind the buoy. 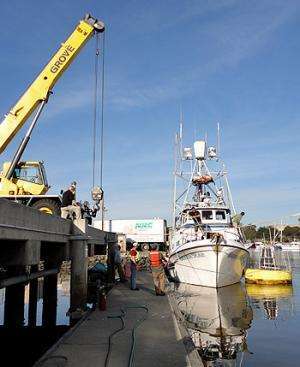 Ropes were then attached to the buoy and the whole assembly was towed behind the boat as it traveled back to the harbor. The power buoy is still in an experimental stage, but once it is perfected, it will help address one of the most persistent challenges in oceanography—powering research instruments and undersea robots. There is currently no cost-effective way to power underwater equipment aside from batteries, which are expensive and have a limited lifetime. Eventually, the power buoy will help scientists extend the amount of time oceanographic equipment can operate beneath the ocean surface. For example, one long-term goal of the power buoy project is to provide an underwater docking station where autonomous underwater vehicles (AUVs) can recharge their batteries while on long-term missions out at sea. During its most recent deployment, the buoy only supplied power for instruments used to collect data for engineering purposes. These instruments included sensors that measure the amount of pressure in the pneumatic spring, a sensor that keeps track of the position of the pistons, a computer that monitors the various parts of the power buoy, and a radio system for sending data back to shore. During the coming year the engineering team will improve the electrical AC-to-DC converter of the power buoy in order to improve the overall efficiency of the system. Hamilton's team plans to deploy the buoy again in the fall, and hopes to run electrical wires down the tether to deliver power to the submerged plate. If successful, this would bring Hamilton's engineering team even closer to creating an underwater charging station. It may be years before the power buoy is ready to be used to power scientific equipment, but these test deployments are important steps toward extending the amount of time oceanographic instruments can operate underneath the ocean waves.